This restored 1969 Chevrolet Camaro Z28 with it's Olympic Gold paint, black interior, M20 4-speed, original "born with" drivetrain, and Jerry MacNeish Certification is up for sale here for the first time in years. This Z28 Camaro coupe and drive train have been certified as real and authentic. The exterior and interior colors are original and correct for this vehicle and match the trim identification tag on the firewall. Mileage shows 2779 miles. It has been disconnected so we do not feel this is correct! 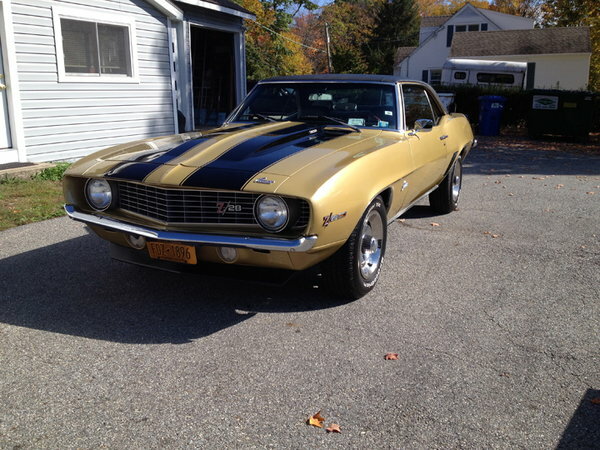 Do not miss your chance at buying this great, original and restored 1969 Olympic Gold Z28. It is very hard to find an original Z28 with its original drivetrain, so buy with confidence this Certified Z28.